Whether you’re searching for breakers or fuses running at above-normal temperature, troubleshooting an HVAC system or searching for structural problems in a residential or commercial building, the Flir E6 Ex-Series Thermal Imaging Camera is your secret weapon for getting the job done quickly and with a high degree of accuracy. Flir E6 Ex-Series Thermal Imaging Cameras provides incredible imaging capabilities at competitive prices. This model has an impressive resolution levels with 19,200 pixels on its large display. 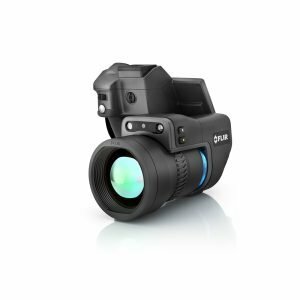 Using MSX thermal image enhancement technology, the camera combines infrared readings with a visual image produced with a visual light camera in a single display. You’ll be able to spot anomalies right at the source without having to guess what you’re seeing on the screen. Numbers and labels are shown on the display in real time, and there is even a colour alarm that warms you of abnormal high and low temperatures, so that you won’t miss a thing. Flir E6 Ex-Series Thermal Imaging Cameras makes inspections as simple as pointing the device. Its focus free lens does the rest, ensuring that you get a clear picture on your screen. Made for ease of use in the field, the camera can be used without removing your gloves. Simplified button controls and onscreen menus allow the camera to be set up in just seconds. After an inspection, the Flir E6 Ex-Series Thermal Imaging Camera allows you to report back to your customer in a professional of manner. You can save JPEG images of problem areas in real time and download them via USB to share evidence of your findings. Plus, the camera gives you access to FLIR Tools, a software image analysis program that allows you to delve into images and generate professional reports. The FLIR E6 Ex-Series camera provides a thermal image with temperature information on every pixel. Building & Industrial anomalies can be spotted fast and accurately. 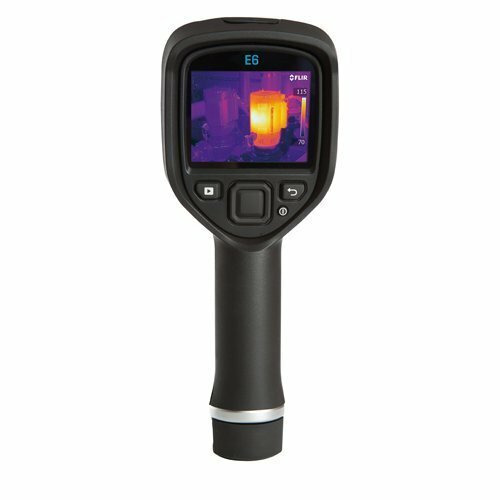 The FLIR E6 Ex-Series camera is a point-and-shoot thermal imaging camera that is an affordable replacement for a spot pyrometer. With a FLIR E6 Ex-Series thermal imaging camera, you can see insulation problems, discover leaks in flat roofs, inspect underfloor heatings, perform blower door tests, detect anomalies in solar panels, check HVAC installations. Please click on the button to Download the Flir E6 Ex-Series Thermal Imaging Camera User Manual. Please bear in mind that you would need PDF reader to open the file.